The firm presently known as Bennet Waugh Corne has roots dating back to 1928. The current firm Bennet Waugh Corne has roots dating back to 1928, when H.I. Corne began the firm Corne & Powell. In 1951, Alvin Corne, nephew of H. I. Corne joined the firm as an articling student and later became a practicing lawyer in the firm in 1956. In 1958, Alvin Corne's brother, Martin Corne, joined the firm which was renamed Corne Corne & Corne. The firm carried on with the addition of different lawyers. In 1973, H.I. Corne retired leaving Alvin Corne and Martin Corne as the partners. The firm was then known as Corne & Corne. In 1991, R. Grenville Waugh joined the firm as an articling student. In 2000, Alison L. Bennet joined the firm. In 2007, Alison L. Bennet and R. Grenville Waugh began Corne Corne Bennet Waugh bringing Martin Corne and Alvin Corne into the firm as associates. 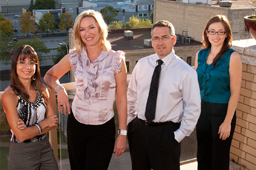 Courtney Wowryk joined the firm as an associate in 2009, followed by Nadia Rumore in 2010. In 2011, the firm name was changed to Bennet Waugh Corne to acknowledge the partnership of Alison Bennet and Grenville Waugh, while still recognizing the history of the prior firm.